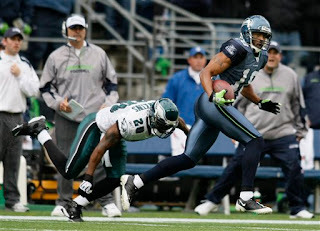 SEATTLE – After an exhilarating 90 – yard touchdown reception in Sunday’s game against the Philadelphia Eagles Koren Robinson was stopped for questioning by two police officers. 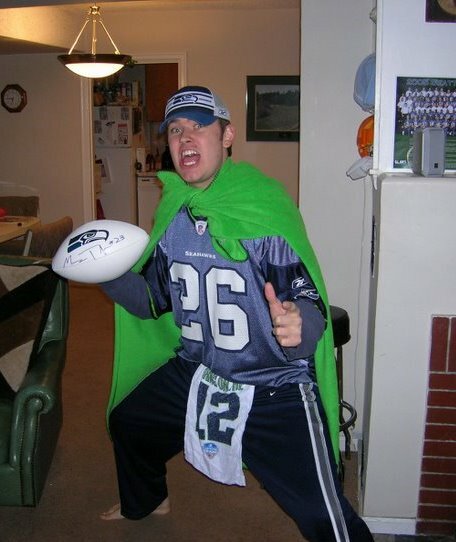 "He was all over the place out there," said Greg Garland of the Seattle Police Department, "He was really putting all of the players on the field in danger. It was pretty obvious that he was under the influence. Someone could have got hurt." Robinson seemed confused by the sudden questioning. "I don’t know what that was all about. I was completely fine to play. The only reason I was weaving at all was because I was trying to avoid defenders." The wide receiver continued to elaborate on what he saw as a non-issue. "Besides, I had to get to the end zone one way or another. And don’t give me this crap about another player driving us to the end zone, I know how to get to there, I’ve made that run before, there’s nothing to worry about, it wasn’t a big deal." The S.P.D. did not accept Robinson’s excuses as legitimate. "He kept telling us how this was his home stadium, and that his bench was only ‘about 100 feet away’" Garber explained, "That may be, but most alcohol-related football collisions take place within 50 yards of one’s bench." Robinson remains dumbfounded by the claims. "Look, there’s no way I was intoxicated out there on that field, I’ve learned my lessons. Sure I snorted a few lines before the game, but if cocaine’s illegal you can arrest me." Robinson was apprehended shortly after making this comment.